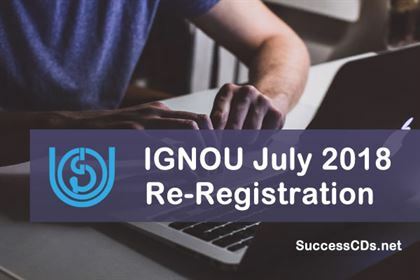 IGNOU July 2018 re-registration starts. Re-Registration refers to enrollment in the next semester or the year of a programme. You can re-register for the next semester/year irrespective of whether you have submitted the assignments or appeared in the term-end exam of the present year. Indira Gandhi National Open University, the students has to fill up IGNOU Re-Registration form for the next semester or year depending upon the programme they are pursuing. The students who are enrolled in two or three year Undergraduate / Postgraduate programmes has to apply for re-registration in the next year or semester. The student has to re-register himself for the next year if they want to continue their studies without any gap. They can re-register themselves for next year/ semester irrespective of the fact that whether they have submitted all their previous assignments, appeared in term end examination or completed all the courses of first year/ semester. IGNOU has also started the online re-registration process for the students convenience. They can fill the IGNOU Online Re-Registration form from home. The online re-registration process is available for only few programmes at the moment. IGNOU will be include the various disciplines of study soon for online Re registration. The programmes for which the students can not avail the online facility has to submit the offline form which can be easily downloaded from the official website. Students who wish to apply for Re-Registration must check the availability of the programme they want to pursue, by clicking on the “Available Programme” tab on the homepage of the IGNOU Online Re-registration website. Once the students know that their required programme course is on the list, you must select the programme and read important details such as eligibility criteria, fee, duration, courses (compulsory or electives), credits, lab, project work. All these details can be seen on the IGNOU prospectus also. If you have not registered their email id and mobile number yet, they must get it registered by visiting their respective regional centre. How to fill IGNOU Online Re-Registration form ? Then enter the “Captcha” image in the text box and click on the submit button. If you will be eligible for re-registration, then you can proceed further to fill up IGNOU Re-Registration form. If you are not eligible, a pop up message will be displayed on screen. How to pay IGNOU Re-Registration Fee online? After completing the form submission process and payment of fee, the students will receive the confirmation email and SMS on their registered email and mobile number respectively.